The 8th round of the Pro Tour was held at the beautiful Phakisa Freeway circuit in Welkom. I really enjoyed the track when I visited last year, and I was hoping for a good result. The handling of my car from the last round had been quite unpredictable and effectively slow, and the only changes made to the car for this round was that I finally had new tyres. These seemed to make a world of difference, as the handling became predictable. Although still suffering from a bit of understeer, this was a lot better than previous occasions. The races went really well, and I found myself fighting hard for 3rd position with Trevor Bland. I had never been on the podium before, so I was really determined to keep this position on track. The tyres seemed to lose grip drastically through the race however, and it was quite a struggle to keep the laptimes quick and consistent enough to keep the position. Eventually I managed to hold it to the finish line, and I was really happy at my best finish ever. 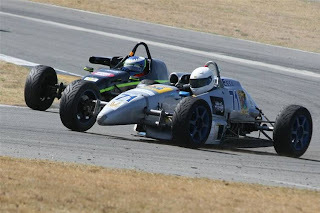 The 2nd race proved to the best experience in Formula Vees that I’ve had! A few quick changes to the car (and last minute repairs, after being pushed off the track in the 1st race and sustaining damage), I found myself right in the battle for the lead. This was an interesting situation, and it proved to be quite an aggressive fight with the local boy and championship leader Dennis Johns, and teammate Courtney Steenveld. Early on, the pace was pretty good and I felt I could lead the race without too much hassle, which was quite confusing and surprising as to why the leaders were that much slower, as I didn’t feel I gained significant pace to warrant that position. Keeping the lead would have involved quite a bit of defending in places I was weaker, and I didn’t want to get too involved in that way. I chose to hang back in 3rd place until the final lap, and just see how things go if I attacked. Dennis Johns in P2 chose to fight back while sacrificing laptime, so Courtney managed to gain a comfortable gap. The rest of the lap didn’t work out to keep P2 at all, and I could only manage to finish just behind Dennis for 3rd again. I am just really happy for my teammate that he achieved his 1st win in Formula Vee, and I can appreciate my position in what has turned out to have been a very successful Lotto development team. With two rounds remaining, I am already thankful for every lap done being a part of the team, and being a part of the Formula Vee fraternity. I look forward to pushing further on my driving and personal developments!